The Leesa mattress is one of the most innovative mattresses to come on the market lately. It’s a high quality product, and this review will help you determine if it’s the best mattress for your particular sleeping needs. Should I Buy the Leesa Mattress? The mattress is made of two major parts, the layered foam, and the cover. We’ll look at each in detail now. Top – The top layer is designed for comfort and cooling. It’s constructed from 2” of Avena Foam. Avena, a patented product, has many qualities similar to latex, but is more durable and lacks some of the drawbacks that you get with latex construction. Middle – the middle layer is designed for support. It consists of 2” of memory foam. It provides a number of advantageous features for the mattress, and helps with its support, pressure relief, and deep compression support. Bottom – the bottom layer of a Leesa mattress acts as a foundation. It is comprised of 6” of high density support foam. Moreover, the highly breathable nature of this layer means that it will not trap excess heat, making for a cool and relaxing sleep. As you can probably tell from our description, the Leesa is a hybrid mattress. Hybrid mattresses aim to garner the benefits of memory foam while minimizing the drawbacks of that material. The Avena foam used in the Leesa is a latex foam alternative. This means that it will afford airflow, cooling, and comfort without the drawbacks of the hot feel that memory foam can produce by itself. The result is great comfort, support, and coolness while you sleep. The Leesa sets itself apart in its construction in that it uses a greater thickness of its signature memory foam/Avena blend, 2” as opposed to the 1-1.5” that you get from a standard hybrid mattress. This extra foam makes a huge difference in the experience of sleeping on the mattress. It’s a very responsive material, and so it can rapidly alter its shape to conform to the shape of your body, molding itself to provide the support and comfort many sleepers are after. Some people might fear that the hybrid mattress will sleep hotter than a traditional mattress using an innerspring design. However, that’s not the case here, as the Leesa is no hotter than these traditional mattresses. Additionally, it provides a similar feel to much more expensive memory foam mattresses like the Tempurpedic. The mattress’s cover is constructed from a single piece of fabric that wraps the whole way around the mattresses itself. Leesa uses a stylish four bar design that helps set it apart from similar products. Moreover, the cover is thick, and is made from well-woven and high quality materials which allow it to stretch perfectly over the mattress itself and provide a sharp look at the same time. 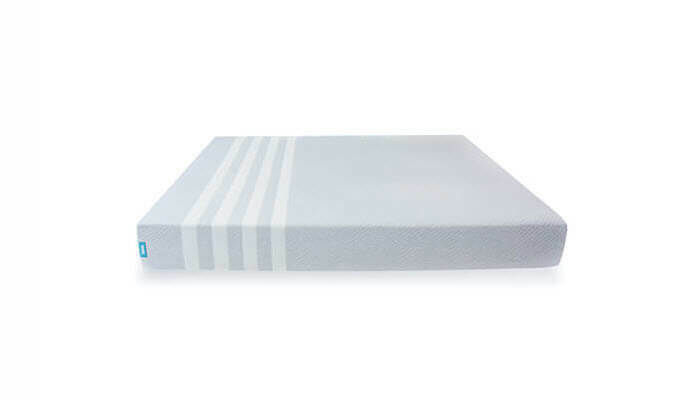 The cover is constructed from a poly-lycra blend fabric, which is the same material used in performance sports clothing, giving the mattress a durable, and breathable feel. Finally, the fact that Leesa as a company puts so much effort into the cover, which won’t be seen again once you put sheets on it, is a good sign that the whole product is well designed and thought out. When it comes to firmness, the Leesa ranks close to the middle of the scale between very soft and very firm, with a slight favor toward firmer. If we were to construct a scale from 1-10, with 1 being softest and 10 being most firm, the Leesa would rank at around a 6. This makes it hard to be when it comes to the overall comfort and support. It simply feels nice as a mattress, especially when you compare it to similar, factory-direct mattress. The greater foam thickness the Leesa utilizes may have something to do with this. It’s true that a greater thickness doesn’t inherently mean that the mattress is better, but compared to the other foam mattresses we evaluated, the Leesa seems to be more comfortable and better at providing cool, breathable support, and the thickness of the foam is one of the main differences between the Leesa and its comparable competition. The specific thicknesses of the foam and the way they are layered also make the Leesa unique, with 2” of Avena in the top layer, 2” of memory foam in the middle layer, and 6” of foundational foam supporting the whole package. 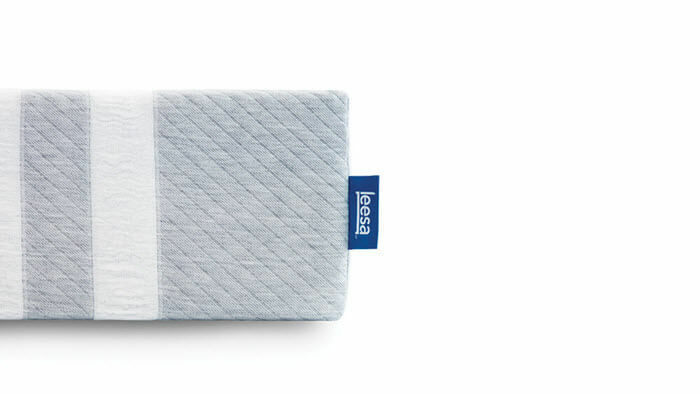 One thing that we’ve noticed in looking at other reviews is that some folks who tried the Leesa have reported they are better able to sleep on their backs after a lifetime of stomach sleeping. This is a sign the mattress might be a solid choice for people who prefer to sleep on their stomachs but should be sleeping on their backs for health or pain management reasons. The Leesa has moderate sinkage when compared to similar mattress. Furthermore, it is pretty good at stopping motion transfer due to the qualities of the Avena memory foam on the top layer. This makes is a great choice for people who have trouble sleeping with a partner, or those who have a partner who likes to move about a lot in their sleep. Here’s the results of our human sinkage tests, conducted using a person who weighs ~140 lbs. Lying on Back – With weigh evenly distrubted in a standard position lying on ones back the Leesa produced about 2” of sinkage. Gently Sitting on Edge – In a test where we sat on the edge of the bed, but did not put our full body weigh on the body we say around 3.5” of sinking. Fully Sitting on Edge – When sitting on the edge in a way that our body weight was completely supported by the bed we encountered 4” of sinking. Standing in Middle – when standing in the middle of the mattress, putting the most weight in the least space, we measured 4.5” of sinking. These are some pretty good numbers for the Leesa. While its edge support numbers weren’t the best, this is a common problem with foam mattresses, and the numbers produced are in line with or better than those put up by the Leesa’s closest comparable rivals. One of the most appealing things about the Leesa is that the company will let you try the mattress for 100 days before you are fully committed to it. That’s about as many days of trial period you can expect from factory-direct mattress options. What’s even better is that if you decide you don’t like the mattress you don’t have to ship it back. Simply let their customer service department know and they’ll arrange for a donation or recycling pickup at no additional cost to you. Leesa also offers a 10 year limited warranty with full replacement service with its 100 day trial. This is pretty standard when it comes to mattress warranties, but it’s nice that Leesa has enough confidence in their product to offer both the trial as well as the warranty. When it comes to mattress prices, they should be evaluated within their class. Specifically, if you’re doing price comparisons on the Leesa, make sure you do compare it to other factory-direct mattress options so you can get an accurate idea of the relative costs. Factory-direct mattresses generally save consumers a good amount of money compared to mattresses purchased from a brick and mortar store. For example, the Leesa offers between $1,000 and $2,000 in savings when compared to brick and mortar prices. In addition to its reasonable sticker price, the Leesa comes with free shipping, and the company frequently has discounts of up to $100, which makes this mattress a great deal and one worth considering when compared to any other mattress on the market. The Leesa is made to order and come directly to your house in a large box. The mattress will be compressed, so no matter what size you order it will fit into a 19 x 19 x 44 box. Manufacture and delivery take from 3-10 days. Don’t forget that the shipping is free! One of the unique things about Leesa as a company is that they are very committed to giving back and helping communities and individuals in need. What’s more impressive is that Leesa has made this part of the company’s foundation since it was a start-up. They donate one mattress to a homeless shelter or person in need for every 10 mattresses they sell. Additionally, the company plants one tree for each mattresses they sell. This means that you’re not only getting a quality mattress when you buy from Leesa, but you’re also helping to support communities that need a hand. Short answer, probably. The Leesa is a solid middle of the road mattress in terms of firmness, which means that it is targeted towards most sleepers. The Avena memory foam provides great support, coolness, breathability, and just the right amount of sink to be comfortable to most people. The combination of Avena with the other layers of the mattress give it a combination of characteristics that many people will find appealing. Even if you don’t know if the Leesa is for you, we recommend taking the company up on their 100 day trial offer. We’re confident you’ll agree that it’s one of the most comfortable mattresses at its price point.